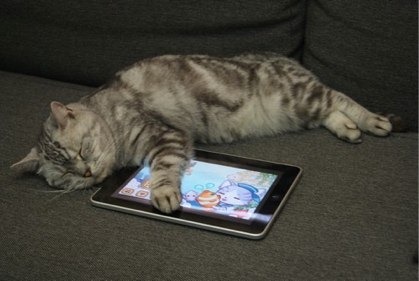 OK, laugh at me if you like – but this image of a cat cuddled up with an iPad instantly made the email it came in my favorite PR approach of the day. That’s just too cute – and I’m not even a ‘cat guy’, much more of a Labrador / dog guy. At it’s core, SubCat’s gameplay is very simple: Wipe away the fog on your screen to reveal the depths of the ocean, as well as different fish and items that dwell there. Then, try to catch and click on the items you’ve been asked to catch before your time runs out. I’m not sure if I’ll end up trying the game out, but I can safely say that the cute cat pic kept the approach email out of the Gmail trash folder this morning. Now if I could just train our cat to treat iPads this way. His current favorite way to interact with the iPad is to walk all over it at every opportunity.